PQA Lincoln had a fantastic autumn with lots of projects culminating in a Showcase of some of the work. 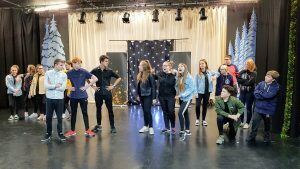 We had examples from our physical theatre project, some devised work that our Red group developed from improvisation and fabulous scenes and musical numbers from our Jukebox Musicals project. PQA LINCOLN POPPETS PRESENT THE GINGERBREAD MAN! This term we are taking part in a fabulous Jukebox Musicals project.